I'm in the middle of a little rearranging of elements on the blog. So some elements are still being tweaked to function properly, mainly the categories and archive links to the right. I am in the process of moving my blog to a new site, [PlethoraofBooks.com]. If you have had the joys of such a process, you know it is a time-consuming task. I'm not moving from one of the big blog platforms, so no plug-in readily handy to just port my post from one to the other. So I am enjoying the lovely process of copy/paste. So bear with me as I slowly move over the rest of my post. I have finished moving over all old reviews and am working on moving over my challenge/project post. I won't go back and fix links to other post until I have moved everything, so clicking a link now for another post will most times transport you to the old blog. I have been entirely too quiet in the past few months and have wanted to start posting again as I am finally able to work on catching up on my many reads. However, I wasn't overly enthused to post another entry to have to move, so here I am partly moved and will be posting all new content here and moving forward to start the new year that is fast approaching on a new front. I am still deciding on my theme and layout tweaks, so don't be surprised if you notice differences as you stop by. Hope you make the move with me. Semi-Charmed Kind of Life blog. Yet again, another month has flown by. My reading life is slowly returning to a more normal level, but still far from where I want it to be. 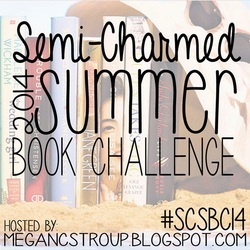 Check-in post for July, month, three of Megan's Semi-Charmed Summer Book Challenge. How many points did I manage to add in July? Not sure that I will be able to acquire many more points in August, I'll have to go over the list of what others have read and see if I can't maybe squeeze in something. The antonyms category is surprisingly a challenge with the books I have been reading. Bit tardy in posting, however, I did pass my reading goal for pages to read during this Read-A-Thon. I did alter a few books from my original plans, but overall a successful event as I was able to accomplish some of my neglected reads. 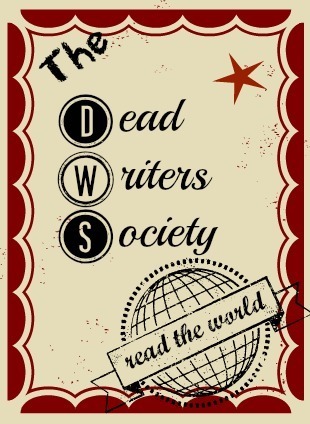 Twitter Users - Don’t forget to use the hashtag #WWReadathon throughout the event. My initial post with full goals can be found here. Button/Logo from My Shelf Confessions blog. I really seem to need some sort of push these past few months to get some reading accomplished. So after my dismal performance during the Book Monsters Read-A-Thon last month I am hoping to set mini-goals to help find some balance this during this period. 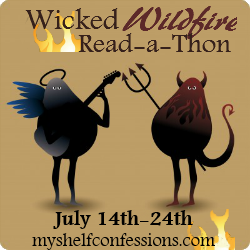 So, look out here I come Wicked Wilfire Read-a-Thon 2014, hosted by My Shelf Confessions. Doesn't the button just want to make you join? My mini goals, nothing earth shattering here I hope. I really tried to limit the goal to average around 30 pages a day. Listed in no specific order, but hoping that with these small baby steps I can find other baby steps along the way to pass these up and get back on track with my year goals. This includes just a small portion of the books I am working on right now, but I have to start tackling this mountain somewhere, even if it is in the middle. Another month has flown by, my reading life still hasn't returned to any level of normal. However, here is my check-in post for June, month two of Megan's Semi-Charmed Summer Book Challenge. How many points did I manage to add in June? 10 points: Finish reading a book you couldn't finish the first time around. (You must have at least 150 pages left in the book to use it for this category.) [The Search for WondLa (WondLa #1) by Tony DiTerlizzi - p. 486] I had stopped at page 26 long ago, for no particular reason, it just got set aside, I ended up just re-reading those 26 pages and moving forward. Full review to come, 4-cups of tea. 5 points: Freeibe! Read any book that is at least 200 pages long. [Chateau of Secrets by Melanie Dobson - p. 400]. I"m not sure why I didn't use this in May when I read it. Review linked to the title. 10 points: Read a book that was written before you were born. [The Screwtape Letters by C.S. Lewis - p. 228]. Full review to come, 4-cups of tea. I'm not sure how many more points I'm going to squeeze out in July and August. The books on my pile don't yet seem to fit many of the remaining categories.